Home » Popular Articles » Malta Diary Just another Big Bang – oh well! Malta Diary Just another Big Bang – oh well! The people of Malta and Gozo are inherently immune to big bangs. For many centuries a focal point in imperial struggles to control the Mediterranean region and therefore North Africa and Africa in general as well as the passage to India and Asia, wars and explosions are just part and parcel of being Maltese. During the Second World War, Malta and Gozo received the most intensive of aerial bombing from German and Italian aircraft per square metre than any other war-torn country in the world. The former airfield at RAF Ta’ Qali alone was bombed as intensively as London during the famous Blitz. And the story continues … an explosion any explosion, does not cause undue alarm or panic because people just raise eyebrows and mutter “not another one?” Life goes on. The national psyche has always been intertwined with mystery. Was Malta linked to Africa and Europe before enormous earthquakes rendered it islands in the centre of the Mediterranean Sea? How did Neolithic man build such enormous temples with mathematical precision over 5,000 years ago? Was Malta the “nerve centre” of the lost continent Atlantis? Are there vast underground communications tunnels running under Malta and Gozo but now submerged in the Mediterranean? Well, all that was long, long ago. However, not to be outdone, modern Malta continues to spin mysteries. At 6.20pm on Sunday 12th June 2011 an enormous explosion rent the islands of Malta and Gozo. The first thought was “just another fireworks factory explosion”. The islands are dotted with about 30 different fireworks factories and an average of one a year blows its top with resultant tragedy and loss of lives and limbs. This however, was much, much more a resounding explosion than normal. The big bang was located in the north of Malta around the village of Dingli. Police, Emergency Rescue and ambulances rushed to the area and found – nothing. There were no smoke plumes, no scattered stones and boulders and no acrid smells. In fact nothing at all was found except the normal. At the time, the Libyan civil war to oust Colonel Gaddaffi was at its height and the waters around Malta bristled with American and NATO ships and aircraft. However, the military authorities quickly issued a statement that neither ships nor aircraft were responsible. The people of Dingli reported the earth had shaken just as in an earthquake and people in neighbouring areas reported windows and doors rattling and shaking furiously. In many areas people took to the streets to learn the source. To this day the explosion remains a mystery bar theories of a massive gas explosion (but no damage reported?) or the boom of a supersonic jet breaking the sound barrier (but hardly likely as NATO adamantly maintained that there were no such aircraft in Malta’s vicinity). So, what was it? The mystery remains unsolved. Thirty years ago on 7th September 1984, Malta Maritime Patrol Boat C-23 left Haywharf in Pieta’ with a load of illegally manufactured fireworks to be dumped at sea. As it sped past the small island of Comino it was rent by an enormous explosion. Five army personnel and two accompanying policemen were instantly killed, leaving just one sole survivor from a crew of eight. The fireworks had been seized from a factory just a day before and although the cause was never conclusively reached, the popular thought was that just one spark from a metal hatch being closed could have caused the explosion. The dumping of consignments is now being done by towed barges. Nineteen years ago there was an even greater tragedy on 3rd February 1995 when nine dockyard workers were killed in a massive explosion that rent the docked Libyan tanker “Um el Faroud” which was being serviced and cleaned at the former naval dockyard. The explosion was the result of accumulated gas in one of the holds. Both these tragedies were work accidents and perhaps caused more sensation because of the numbers killed. However, fireworks-factories related deaths are more common and unfortunately more frequent. The Maltese love fireworks and love to manufacture them. 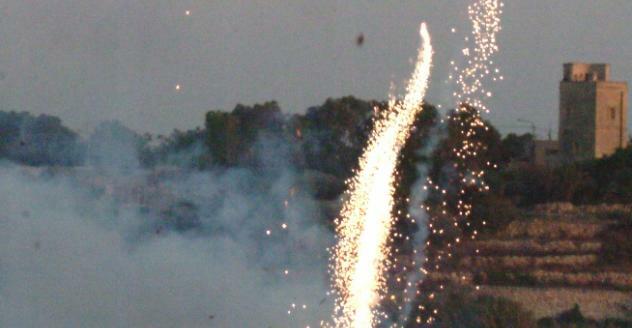 Most major parishes have their own factories but despite all the safety precautions taken and despite the centuries-old expertise of the people involved, fireworks are fireworks and can be unaccountably volatile – particularly in hot and humid climatic conditions, and Malta and Gozo have both. One of the worst happened just two years ago in the small Gozitan village of Gharb when the factory exploded and instantly killed the five persons working there and rarely does a year go by without a tale of explosions and victims. As if all that were not enough, car bombs are not a rarity in Malta. Only last week a Malta Police Inspector had a car bomb explode outside his residence in Zurrieq. Considerable damage was caused but luckily there were no victims. However, don’t get the impression that Malta is a violent place with bombs and explosions here and there. Relatively, death and injury in fireworks accidents as compared to the enormous volumes of fireworks manufactured annually is very minimal and car bombs are either gang related or involve the police authorities.